We got to talking around the Kitelife office, discussing those areas of kiting that we haven’t focused on recently… You know – those “power” guys, and some folks in other countries, and the Kite Aerial Photography (KAP) aficionados, and also some of kiting’s “historical” figures too! Anyway, Bob Childs’ name came up in our discussions, and we said, “Ya know… we aught to do a piece on him!” So we wrote to Bob, and he’s graciously agreed to a Kitelife interview. 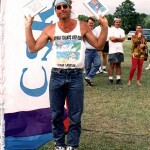 If you’re not familiar with Bob Childs, he first became kind of a fixture on the USA Comp Circuit in the early 90’s, usually flying one of his own kites… Bob was very involved in the early evolution of “slack line” dual-line flying, too – and he pioneered several of the tricks in use today. But Bob was always delighted with the thrill of “Big Pull” and the “traction” aspects of kiting, so when “Power” began to emerge as a separate part of kiting, Bob naturally gravitated in that direction. He’s living in Europe now, but is still very much involved in kiting – building kites and kite-skates, doing some internet work, attending festivals, flying often, and… Oh, heck!!! Why don’t we just let Bob tell you about it himself? All right, Bob… Let’s start with the simple stuff. I’m assuming you first got bitten by the “kite bug” fairly early in life. How did that happen, and what was the result? 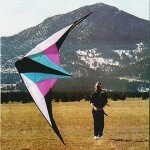 It must have been 1985 when my friend (and soon to be pioneer kitesurfer) Troy Navarro bought a 10ft Flexifoil kite. He’d previously had some toy-quality stunter that we played with a couple times, but it was the power of this 10 footer that impressed us. 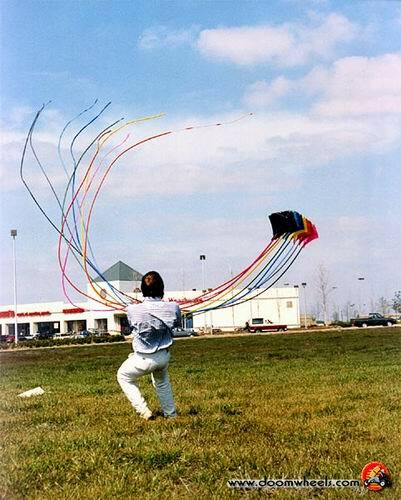 We lived in Texas at the time where the wind is constant and soon developed a thick collection of foils and delta shaped kites spending any free moment flying at the local school field. I eventually put together a long stack of 4ft diamonds with 100ft tube tails flying them regularly at the school which sits alongside a major highway. This caused a lot of interest from folks passing by on their way home from work and many got out of their cars to come talk about the kites. Soon the local interest grew and several of us met there each week. I suppose flying that powerful and colorful stack both challenged my endurance and soothed my spirit. By today’s standards, it was very basic flying, but I was pleased to spend endless hours flying loops and ground passes painting the sky with those long flowing tails as the 5 o’clock traffic looked on. These were good times. After catching the kite bug, I quickly became involved with the local kite club – JOTS (Jewels of the Sky) and more ingrained in the kite community. 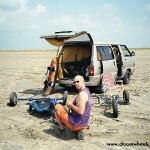 There were several new events in Texas enticing an energetic and diverse group of kiters. I first began competing at one of these small events (probably in Waco) and took first place my first try. It was both exciting and rewarding and I knew then that this was what I wanted to do. I continued competing throughout Texas finishing very well while trying out new forms of flying that would evolve into a style that reflected my character. At that time, pilots flew with smooth, solid motion. 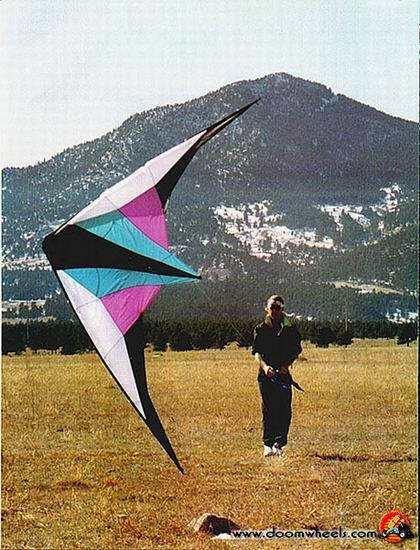 I developed a style of loose-line flying with floating and stalled maneuvers – a method of madness that the kites of that time were not designed for. This would lead me to start designing a kite that could respond to the type of flying and trick maneuvers that I imagined. When I attended my first big event in Wildwood NJ 1989, I was flying a modified Hawaiian Spinoff. I finished poorly but learned a lot from the experience. 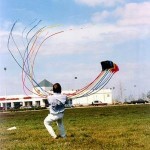 When I returned the following year with my own kite, my luck greatly improved. 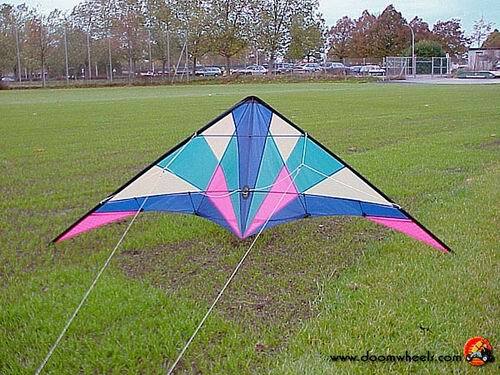 The sport kites of the mid to late 80’s were very dependable, stable kites with predictable mannerisms. 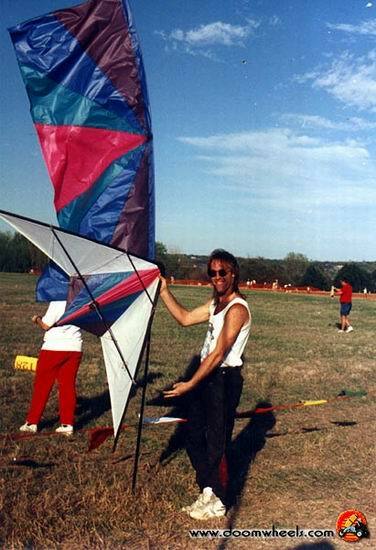 If I were to be able to project anything of myself into my flying, it would have to be through a kite that was as off-the-wall as I was back then. I built a couple horrible kites trying to mimic what I saw others doing when I realized I needed to take a different approach. I recorded the attributes that I liked from various existing models, examined what it was that caused those desired effects, then combined them all into one design that not only reflected my style, but allowed me to push the limits as an early radical performer. The Wizard inspired me to develop tricks not possible with earlier designs and create routines that spoke a personal message. You’re on record as the man that created several of the current “tricks.” Tell us how you devised the Broken Yo-Yo Launch, the Turtle, and so forth… Were they successful for you in competitions, or were they just fun to perform? When I returned to Wildwood in 1990 with the Wizard and a handful of tricks, all the field time experimenting with short lines, stalled maneuvers and groundwork paid off. I started my routine with the kite standing back to the wind – jumping to a nose stand – laying over onto its back then performing a turtle launch each emphasizing the musical score. I was intrigued by creative groundwork and the judges’ response was enthusiastic. Tricks like the Broken Yo-Yo (launch), the Yo-Yo (in flight), the Turtle (launch) and others came from long summer days making a huge mess of my lines trying out any strange thing that came into my mind and working it into something that I could pull off 8 out of 10 times – my rule for using a particular trick in competition. I love tricks that look dangerous and unique yet compliment a dynamic routine reflecting the emotion of the music. But to answer your question – how did I come up with these tricks… I just wondered what would happen if I wrapped a kite up with the strings and pulled it this way or that, then worked it out until I either got it right or broke something trying. Right along with creating these new tricks, you also designed and produced several fairly well-known early kites. We know about the Griffin, the fabulous Jabberwocky, and the WhangDoodle among others, for instance – and I still happen to own a 3-stack of Goblins (LOL). So how did your kite designs happen to evolve? 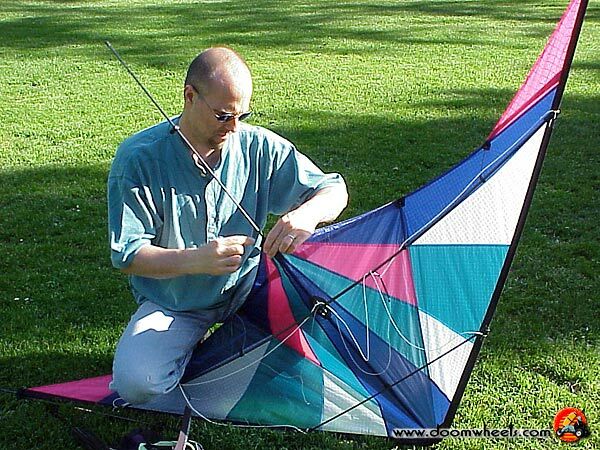 After the Wizard, I wanted to tryout innovative methods of manipulating wind across a kite wing to enhance performance by, what I called, Gadgetless Wing Mechanics™. These were techniques of forming the wing to a desired shape depending on the wind speed without the use of leach lines, multiple standoffs or battens and without increasing setup time. The features were built-in to the sail design and functioned by automatically adjusting to the varying wind conditions. Some of the most successful features were the Camber Adjustment System™ of the Jabberwocky and Wing Silencers™ of the Chicane and Jabberwocky G2. The WhangDoodle was an experiment in manipulating wind across the back of a sail by using self-inflatable panels along the leading edge. The result was a 10ft kite that could hold its form in any condition shedding wind to maintain a desired level of pressure. It was a big kite that flew agile like an 8 footer. With all my designs, I wanted to achieve three goals… fly with a performance style that satisfied by personal expectations, provide a measured balance of stability and agility allowing pilots to enjoy both graceful flight and edgy tricks, and to inspire more innovation and creativity in an industry that appeared resolved to rehashing the same designs over and over. 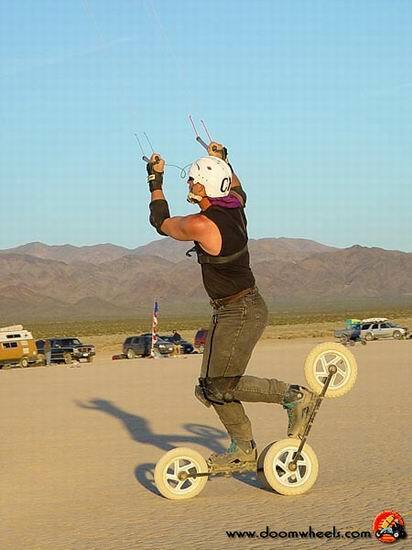 And somewhere in the early to mid-90s, you kind of broke away from the “traditional” dual-line stunters and comps, and you got into the traction or “power” kiting game. What did you see in power or “extreme” kiting that interested you, and where has that interest taken you? 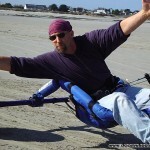 My interest in kiting started with power and never detoured. 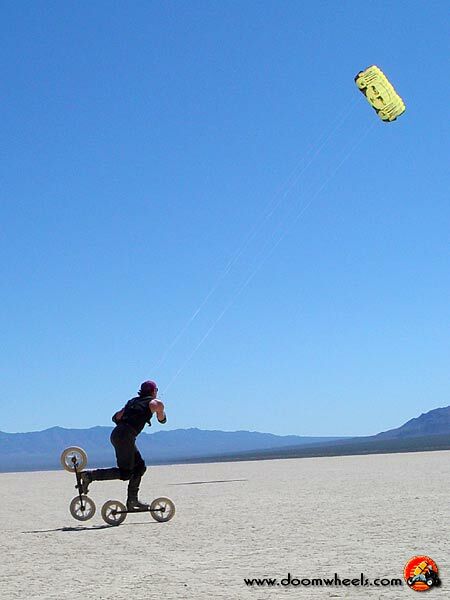 From the early days with that 10ft Flexi, we experimented with various forms of power kiting. One windy day in ’87 we grabbed a flattened cardboard box and began riding it across the cut grass, first sitting then standing, pulled by a stack of foils. As we were also heavily into wakeboarding and had the necessary equipment, it was only a short step from riding cardboard across the grass to riding wakeboards across the lake pulled by kites. At the time, we could only cut as high as 45 degrees to the wind, but with a chase boat on hand we regularly crossed the wide Texas lakes. 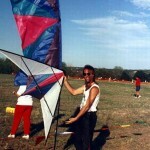 From then until now, what I love is the feeling of channeling the energy of the kite through my body causing motion. Once moving, it feels as if I am standing still while the earth moves under my feet. I’m challenged by the power, yet feel complete freedom to choose my course. It’s a partnership with the elements that I find rewarding. So how did you get into kiteskating? 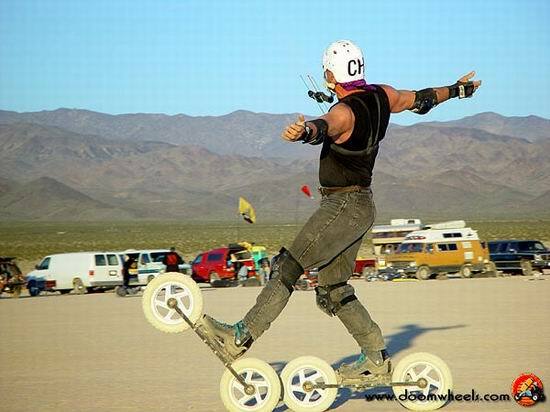 What led you to develop the Doomwheels kiteskates? 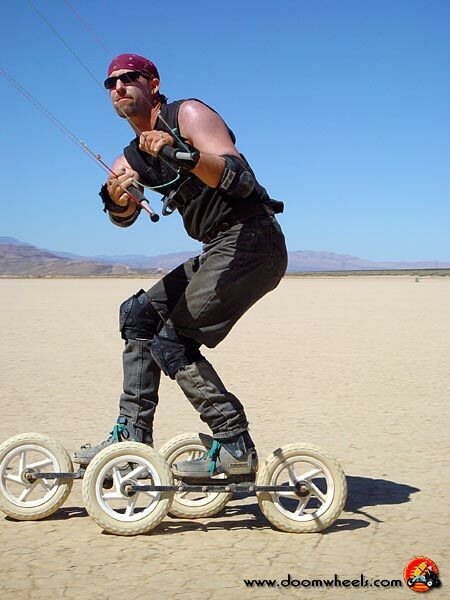 I had already been kitesurfing for a couple years before I bought my first set of inline skates. 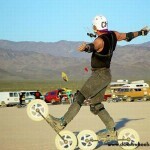 Rollerblades had just become popular and were clearly the perfect platform for surfing on land. 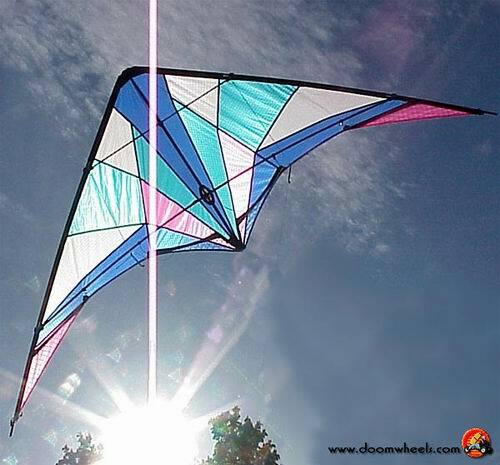 I first tried it using a Revolution kite on short lines – quadline kites was the right idea, but I needed more power. 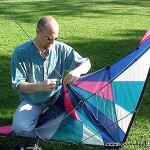 The introduction of the Quadrifoil solved this problem and it became commonplace to find a group of kiters skating the parking lots during and after kite festivals. When kite buggies arrived on the scene, festival spectators could enjoy buggy demonstrations from their seats on the kite field, leaving us skaters to ourselves out on the blacktop. 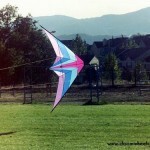 I wondered how I could bring kiteskating to the kite field and started modifying my inlines. The wheels started small but grew larger as I realized the realities of harsh and unpredictable terrain. Scooter wheels worked perfectly and after a few balance modifications, I took my first ride. The big, heavy skates were awkward until I launched the kite and started rolling under its power, then everything changed. 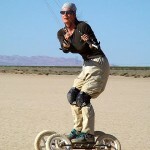 The sensation was amazing and brought back that original joy I felt when I first got into kiting. Since then, I’ve encouraged others to join in and therefore published simple instructions for making kiteskates at home. 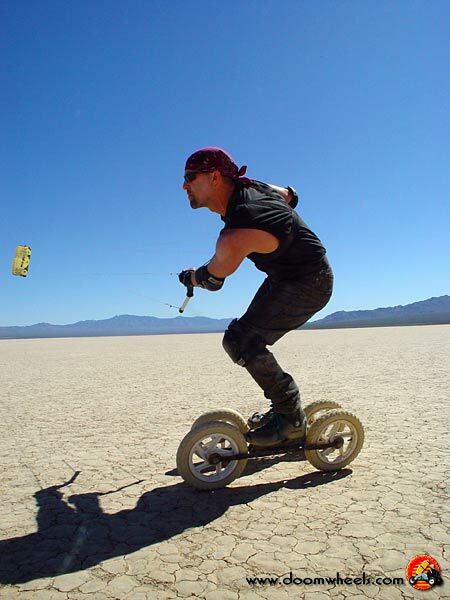 The past few years has seen a sharp increase in kiteskaters and it’s a thrill to watch a small pack roll together across the playa. Can we assume you’re not really a solid force in the traditional dual-line stunters scene anymore? Due to health issues in the mid 90’s, I retired from dual-line competition and kite manufacturing, but I still design sport kites once in a while whenever something inspires me. Although not well known, the Jabberwocky G2, introduced in ’03, is probably my best design. Most of my current efforts are focused on supporting and promoting kite traction events and enjoying kite sports as an enthusiast. Well, what’ve you been doing over the last decade or so? 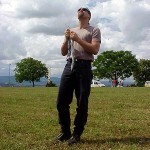 Where has your kiting interests taken you, and what have you been doing with those concepts? After retiring from competition, I dove into power kiting and hosted the first American buggy races at the Bonneville Speedway in ’94 (Bonneville Buggy Enduro). I hoped to establish a base set of records under measured conditions that we could challenge and amend as pilot skill and traction gear improved over the years. Even though poor wind conditions prevented us from achieving this goal, it was a memorable event that introduced feature races like the 50 Mile Enduro now used by other popular events. After this, I took a short break from kiting to finish my studies and travel western Europe. As a result, I have a new home on an old continent where traction events are plentiful and I support kitesurfing and winter kite traction events in the region. I’ve judged events such as the Engadin Wind Kitesurfing World Cup and the Winter Tour (kiteboarding freestyle) for the past 5 years. My goal is to work with tour organizers to develop fair judging standards and improve safety conditions for the riders. 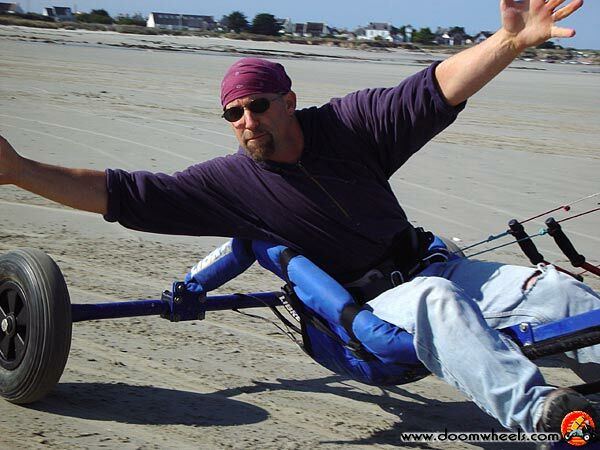 When did you decide to develop your marvelous Doom Wheels and It’s a Breeze websites, and when did you add the Power Kite Forum to your web offerings? 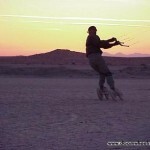 Doomwheels Kiteskating has been online since ’97 to help spread awareness of kiteskating and other forms of kite traction. I wanted to provide a historical record of a sport that I love and pass it down to future generations of kiteskaters (something we didn’t do very well in sport kiting). 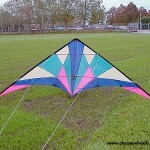 It also serves as a media library for the various forms of kite traction increasing in size each season. I also host the Kiteskating Resource Center to help folks find materials and gear needed to get into kiteskating. 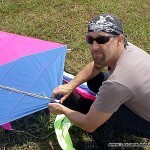 The It’s A Breeze Kites site is primarily a support site for the kites we’ve sold over the past 15 years. There are also tuning tips and trick instructions. Additionally, visitors are able to purchase a selection of IAB kites (such as the Wizard and Jabberwocky G2) directly from the site. The Power Kite Forum (PKF) is a pure power kiting information and resource forum for sharing knowledge and increasing awareness of all kite traction sports. 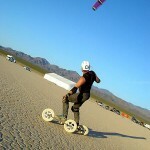 It also hosts the official forums for some of the top kite traction events. It’s still young but growing fast and its goal is to become a key database for kite traction info, instruction and media. PKF is a community resource and is not associated with any commercial entity. 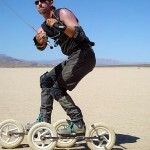 Fascinating… Your Doom Wheels website talks about your interest in Kite Skating and also a bit about Kite Surfing and Skiing. What’s the split between them as far as your time goes? I’m assuming you Surf in the summers and Ski during winters, but I may be wrong… Do you travel much to go where the kiting “action” or the good weather is? Yes, the summers are for kitesurfing and in the winter anything goes on the frozen Alpine lakes. I live in a great location near the high mountains that allows me to enjoy water and snow conditions all in one place. However, we unfortunately lack beaches and open fields for buggying or skating so I either travel to the coast or impatiently wait for our next trip to the California desert (my favorite). In previous years I’ve buggied amongst WW2 bunkers in Normandy and Brittany and surfed the shoreline of the French Riviera. This summer, I hope to make a trip up north to Denmark to tryout some of the wide, hard pack beaches of Rømø; can’t wait! Tell us a bit about the “organizations” behind these power disciplines. Are there meets, competitions, and festivals, or do people just people get together to play when the chance occurs? How does that work? 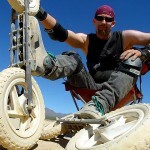 In several countries around the world there are friendly buggy meets like Corey Jensen’s Spring and Summer Thang and official races like the British PKA events or North American Buggy eXpo (NABX) on Ivanpah Dry Lake CA. It’s common to stumble upon races and meets nearly anywhere along the coastline from France to Germany. There are even desert crossings set in Morocco, Tunisia and Australia etc. Kitesurfing and winter traction is even more visible and organized with a few strong world tours scheduling events around the globe. 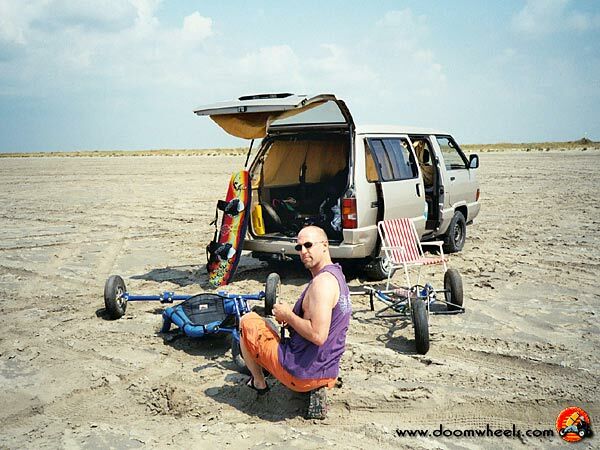 But it is also common to find individuals or small groups kitesurfing on almost any beach that allows it. Information regarding these events are best found online. 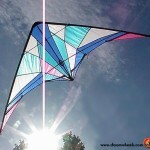 The Power Kite Forum has a links page listing several. 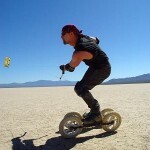 Do you foresee the day when power kiting or kiting in general becomes “mainstream? 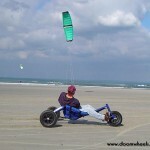 I know kiting is perhaps a bit more popular in Europe than it is in the USA. Is kiting a mainstream sport in Europe in your opinion? Regardless of the continent, I foresee land traction continuing much as it has with steady growth for a handful of well organized race events. Pleasure riding events will come and go with some good ones developing a small yet faithful crowd. Kite “All Terrain Boards” (ATBs) will likely pump some new blood into land traction, though I doubt it will become strong enough to stand on its own or develop independent events. Sport kiting has passed its peak in much of the world, but could possibly boom again in the future. Those involved are dedicated and passionate, however organizers would have to overcome the issues that have held the sport back in the past. It’s a highly skilled sport that isn’t always obvious or interesting to the average spectator. Testing competitive skills while entertaining the audience is an ancient dilemma. Kitesurfing, however, has something that the other kite sports lack. It has strong financial backing, accessibility for spectators and media, it has action, risk and excitement and a product industry with history and knowledge of successful advertising strategies. The stores are well supported by instruction centers and the products are priced to promote legitimacy to water sport enthusiasts who (unlike kitefliers) expect to spend thousands on their equipment. I believe that kitesurfing as driven by well established water sport companies and strong sponsors will surpass windsurfing in both popularity and longevity. Though it may not replace Monday night football, it’s likely to be seen in the top-of-the-hour Budweiser commercial break. Now, how about “Futures?” To start with, how do you see the kiting lifestyle of Bob Childs evolving over the next few years? More designs, more products, more festivals and events? Or do you foresee other changes from what you doing now – and if so, what changes? Oh, I think I’ve completed much of my evolutionary process and am happy keep on doing what I do. I plan to attend as many events as I can as either a helper or a rider and hope to affect the sport in a positive manner. 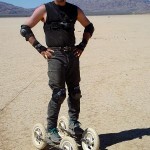 I plan to enjoy myself hanging out with friends in the desert and kiteskating long reaches across dry lakes with my wife (Mrs. Doomwheels). I’m pleased to offer support to my favorite events and could entertain the idea of hosting another of my own if I were to come up with an interesting venue. 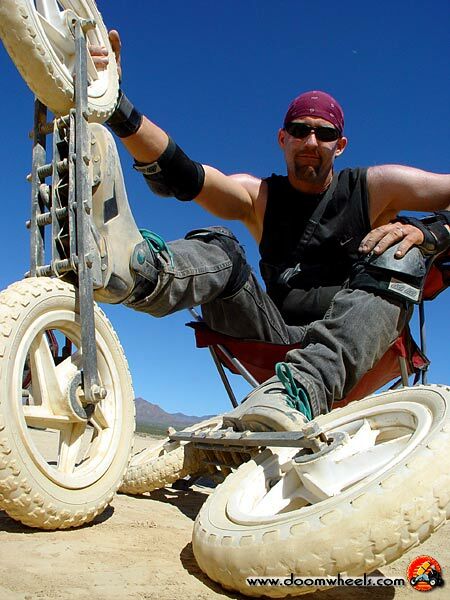 Who knows… maybe I’ll return to Bonneville to host the BBE2. Regarding kites, I still have some design ideas I’d like to try. I even have some single line designs I’ve been sitting on for a few years. 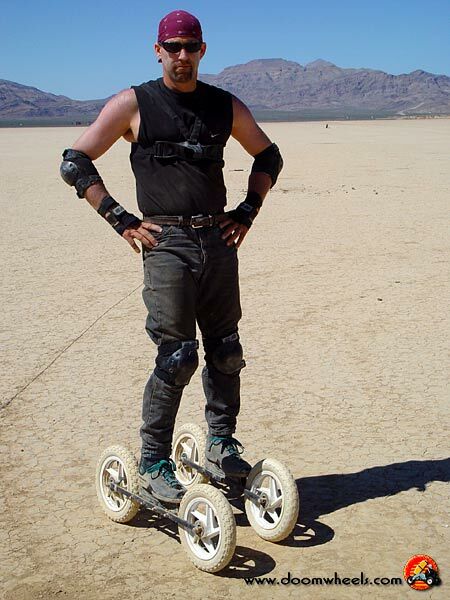 However the next thing you’ll likely see from me is longer skates, bigger wheels, higher jumps and faster speeds! Okay… Now, how about the sports themselves? Are they evolving, growing, and changing? In what ways? 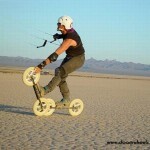 What do think will be “big” in kiting in the future, and what will remain the same or dwindle? And Why? The biggest change in land traction I’ve seen is the performance quality of the newest kite models. The past 3 years have seen some really well thought out designs hit the market and I think this momentum will continue for a few more. We’re finally getting to the point where pilots know just what they want and designers have figured out how to provide it. Kitesurfing, of course, is the most popular kite traction sport and I expect to see it push forward with riders performing more complicated and powerful maneuvers. I hope to see riders put more emphasis on surface tricks and kite control. Kitesurfing, more so than the other traction sports, has the ability to become a world-class sport. All right! Back to “traditional” kiting for a few moments, here. 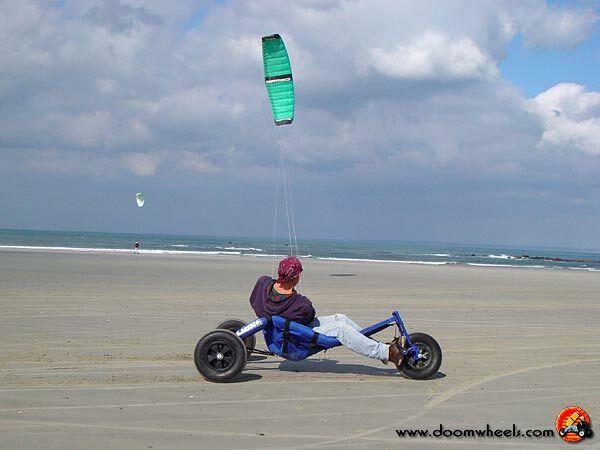 How do you see the traditional kiters and the power folks co-existing in the future? Do they grow closer together, pull further apart, stay about the same, or change in some other way? And what are your reasons behind those conclusions? I don’t foresee any real big change in relations between the various kite camps. As there is already a lot of crossover, I think relations are pretty good. It’s just that folks tend to migrate toward the type of kiting they like best and bond closest with others who share the same interests. 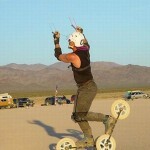 In the end, we all are kiters and should work together to promote all the various forms of kiting. 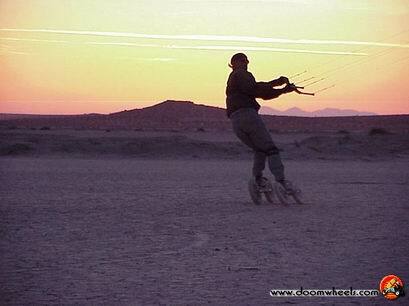 Kitesurfing, however, is in many ways a group unrelated to the greater kite community as we know it. The bulk of kitesurfers and product manufacturers come from windsurfing and wakeboarding and the events are largely sponsored by companies that have paid little attention to traditional kite events. It is hard for us to imagine not being the overseer for all things involving kites, but I believe the kite community would have to do some catching up in order to become more closely allied with kitesurfing. If you see the two factions remaining apart or diverging more than they are now, what do you think it would it take for those factions to pull closer together? Can you foresee the day when traction and more traditional events could share the same arena, be co-sponsored, co-hosted, and co-judged? Is that something that would interest the power kiters, or are they simply not interested in being allied with the more traditional forms of kiting? Again, aside from kitesurfing I am unaware of any huge division between sport/single line kiters and powerkiters. The events may run separately, but I think the participants come together often to enjoy the various disciplines. 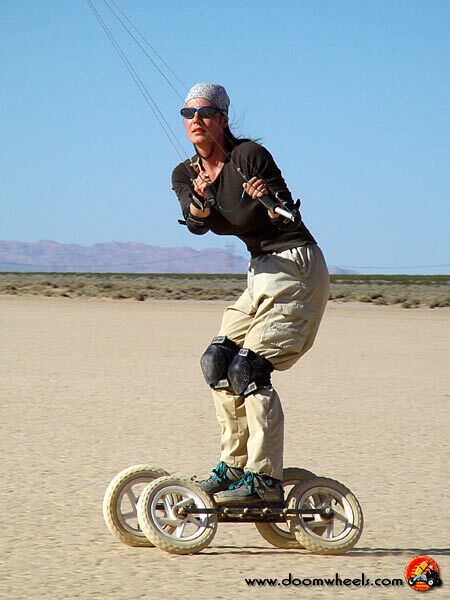 But regarding combining traditional kiting events with traction events, not only would it be complicated and costly, I personally can’t imagine the benefit. To me this would be like combining horse races with a baseball game. The beautiful thing about kiting is its diversity – we do so many things with kites and don’t have to cram them all into one package. Better to enjoy a variety of kite sports and traditions each in their own style and location. 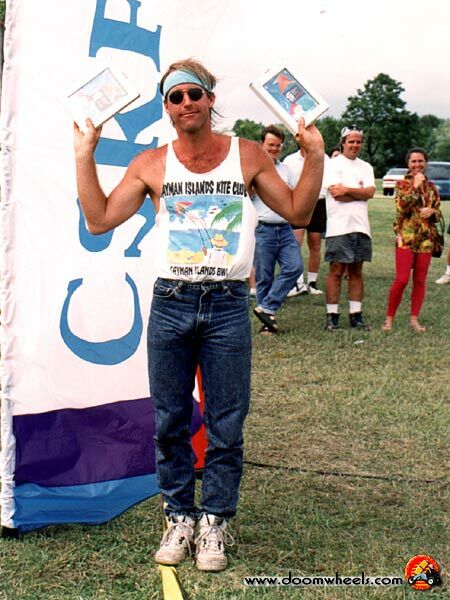 Bob, you’ve pretty much “done it all” in kiting at one time or another. You’ve been a dual-line competitor, kite designer/builder, power-gear producer, and power enthusiast. 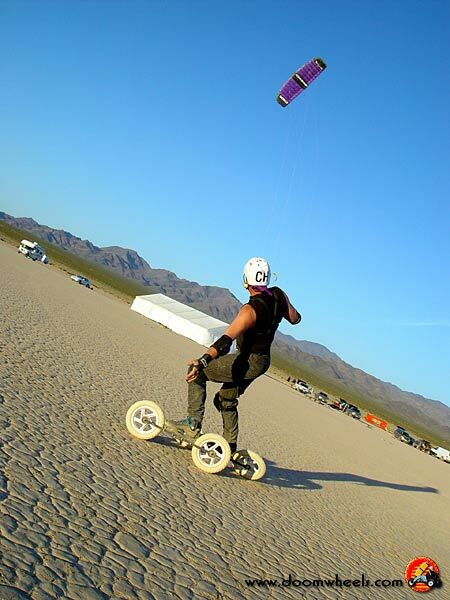 Have you any interest at all in some of the more traditional forms of kiting? For instance, would you be interested in judging (or competing in) S.T.A.C.K. events or within the AKA leagues? Or is there any other “official” function you’d be interested in doing – either specifically for power kiting, or for kiting in general? Over the years I’ve worked as judge and head judge for sport kite events in all disciplines, judged kitesurfing and winter kiteboarding tours, I was on the AKA Sport Kite Committee for several years helping to develop the rules book, I hosted the Bonneville Buggy Enduro, assisted in translating traction event rules books and now quietly support a short list of land, water and snow events. In the future, I plan to continue pushing the issue of rider safety and hope to work closer with organizations to require adequate insurance for race events. But I doubt that I will be returning to competition anytime soon. I enjoyed my time on the competition field and am now pleased to do my part behind the scenes. Sir, thank you so much for taking the time to chat with Kitelife. We certainly appreciate all of the energy, talent, and expertise you’ve shared with the kiting communities (both traditional and power) over the years. It’s been our delight to spend this time with you in the interview, and I’m very certain our readers feel the same way. On their behalf, Thank you! My pleasure! And thank you for providing this great e-zine and its media archives to the world. 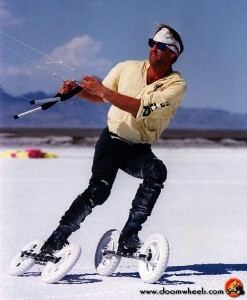 You’ve done much to preserve the history of kiting and inform the public about kiting in an honest and positive manner. Keep up the good work. 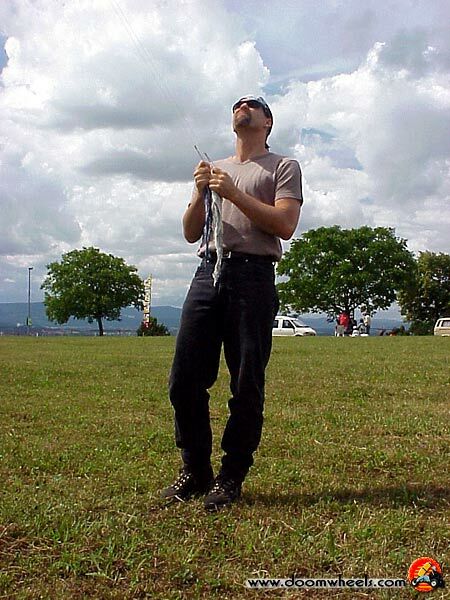 This entry was posted in 2005, General Topics, Issue 41 (Mar/Apr), KL Archive and tagged interview, kite skating, people, power kites, profile, sport kites.